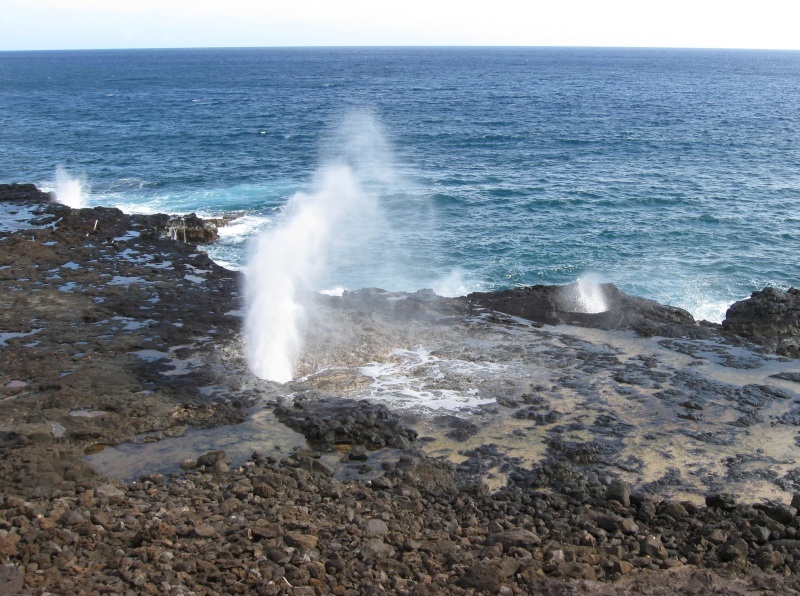 The name Poipu means “crashing waves” and is an area on the south side of Kauai. Beaches there are some of the safest beaches on the island during the winter months (October – April). That may explain why it is also one of the most popular places on the island. Poipu covers a large area including several beaches. Some people lump all the beaches together as Poipu beach. In front of the Sheraton is Kiahuna beach and the beach in front of the Marriott is Waiohai beach. On the east side of Poipu beach park is Brenneke beach. Kiahuna beach has the most sand and least rock. 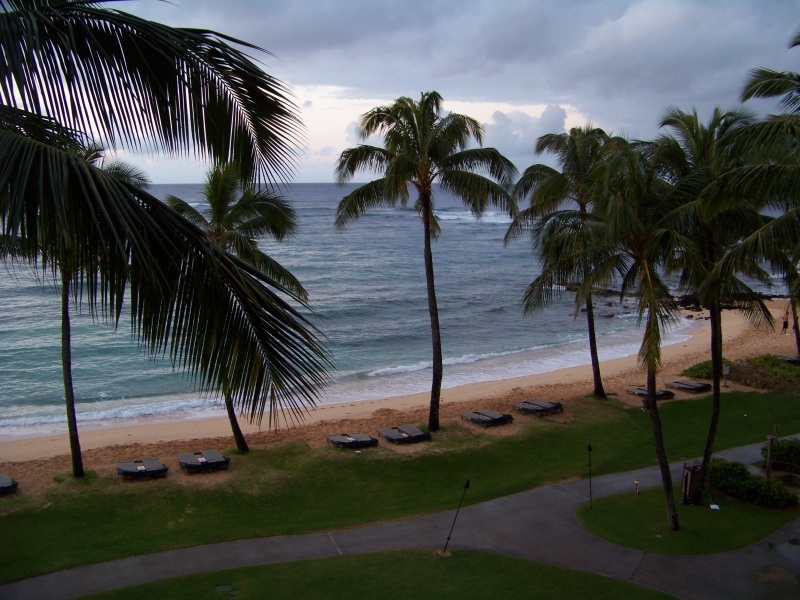 It is well maintained by the crew at the Sheraton Kauai resort. It is also one of the more popular spots to boogie board. From the map above, you can see a tombolo (a sandbar connecting the small patch of land to the mainland) between Waiohai beach and Brennecke beach. The water is calmer just on the east side of the tombolo and many children play in that small protected cove. When the waters are rough, it is quite a site to see the waves crash against opposite sides of the tombolo. Here is a picture of the tombolo from the west side. From the picture you can see that this is not a secluded beach. It gets quite crowded in the middle of the day. It is also a popular spot with locals so there are even more people here during the weekends. Also notice the rocks. You will want to wear reef shoes when visiting or suffer a stubbed toe or two. 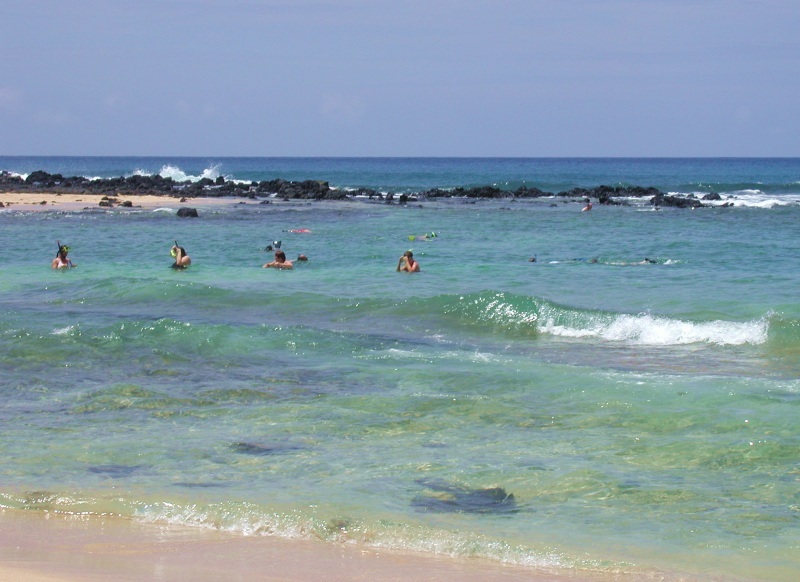 Poipu beach park is a popular place to snorkel and with reason. 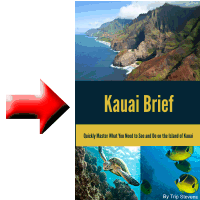 You can spot all kinds of different fish there: eels, moorish idols, unicorn fish, goat fish, convict tangs, yellow tangs, and the state fish, the humuhumunukunukuapua’a. Once when I was snorkeling there, someone spotted an octopus a little ways out. I tried to find it but could not, although I heard several claim to have seen it. Poipu beach park may be popular for all of its amenities. The park has lifeguards (during peak times), bathrooms, outdoor showers, BBQ grills and covered picnic tables. There is also a simple play structure for the little ones (keikis) when they get tired of playing in the water. The beach there is also a very popular spot for building sand castles. Another reason for Poipu’s popularity might be its proximity to food and equipment rental. Just across the street (Hoone road) you can get shave ice or lunch or dinner at Brenneke’s beach broiler. That is a great place to eat during sunset and at night when the moon is full as you can still see the ocean across the road. Its a great image. Also across the street from the park, you can rent your boogie boards and surf boards at Nukumio Surf Shop. You can also pick up an underwater camera there. One thing to consider when visiting Poipu beach park is that there is not alot of natural shade there and the sun gets very hot. Bring an umbrella and use your sunscreen early and often. I have never been to the beaches at Poipu when there hasn’t been at least one beet red guy there running around showing off his physique. The peak intensity of the sun comes when the sun is perpendicular to the earth–between 10 am and 2 pm. This also happens to coincide with the peak popularity of the beaches. That might be a good time to take a shopping break or head back to your hotel to cool down and take a nap. 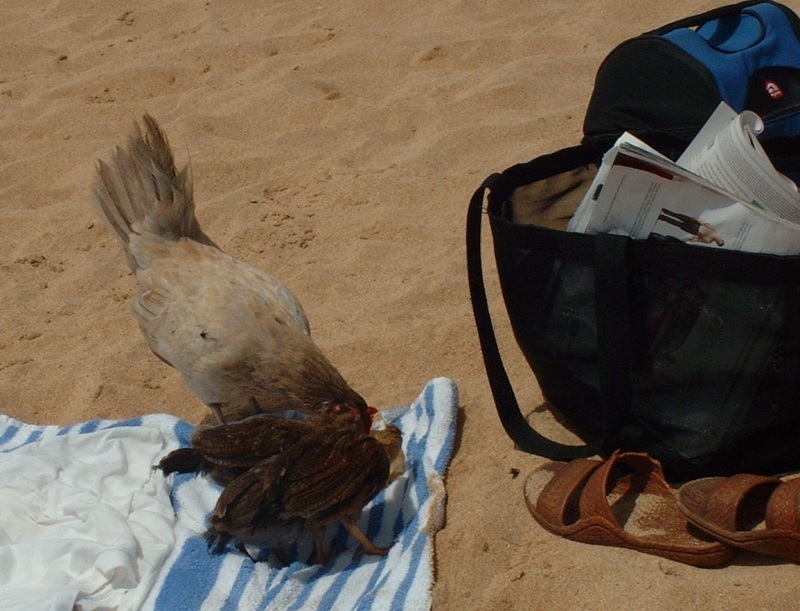 Poipu beach park is also over run with Kauai chickens and they will come scrounging for food. They are pretty harmless and can be shoo’ed away quite easily. Here is a picture of three chickens eating the remains of an apple core. We did not feed them but returned from a dip to find them in our spot. Chickens are not the only wildlife at Poipu. Many Hawaiian monk seals and sea turtles come up on the beach to rest. While it is exciting to see these big sea creatures up close, you need to keep you distance. Usually when one of them comes up on the beach, a team of volunteers quickly cardones off the area to give the seal or turtle a little space. The lifeguards are usually pretty good about keeping people back. Seals usually come to the beach to digest a big dinner without being attacked by one of its predators. They can be in the same spot for as long as a day or two. Turtles usually don’t hang out as long. The wildlife that beach there are often repeat visitors. 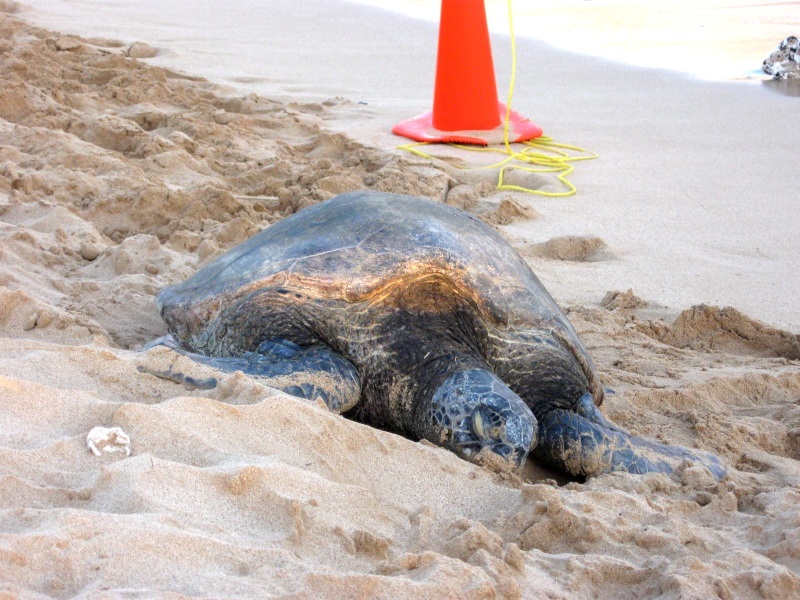 One of the turtles often spotted at Poipu is called Cracky for its cracked shell. 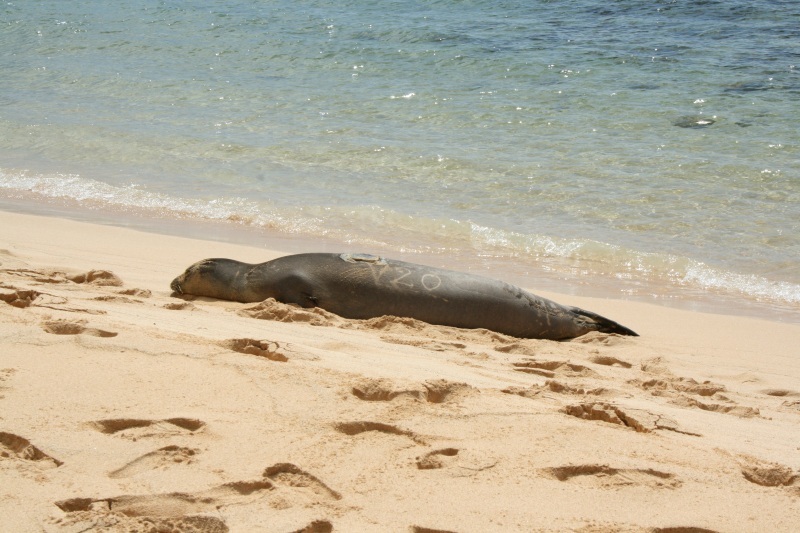 The Hawaiian monk seals are endangered and have been tagged and marked in categories. The seal shown above is in category “V20.” Please give these gentle creatures a break and stay back as far as the lifeguard instructs. I think the area roped off is about 15 feet so try to stay well outside of such a boundary–even if it does not exist. If you happen to witness a seal or turtle come out of the water, call the monk seal foundataion at 808-651-7668 and let them know so they can rope off the animal. Other things to do while visiting Poipu would be to golf or go shopping. World class golf is available over at the Poipu bay golf course adjacent the the Grand Hyatt Resort. 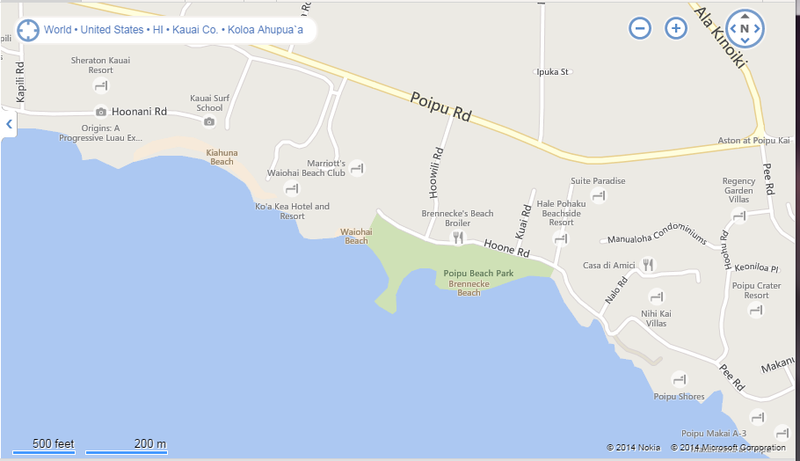 A couple of nearby shopping options include The Shops at Kukuiula and Old Koloa Town. If the water is really rough, you should go down the street (5 minutes trip to the east on Lawai Rd ) to visit spouting horn. While rain is much less frequent on the South side of Kauai, it does happen. When it does, you could go shopping or even snorkeling. I snorkel when it rains and find it a lonely business as most folks pack up and leave. Since I am already wet when I snorkel, the rain doesn’t bother me. The only problem is that with overcast weather, it is a little darker under the water during those periods. Unless you are at Polihale beach at sundown, which is tough to get to but well worth it, tropical sunsets are harder to come by on Kauai. There are no resorts on the west side and many on the east side of the island. If you wish to catch a spectacular sunset, your best bet is to hit the north west or south sides of the island. 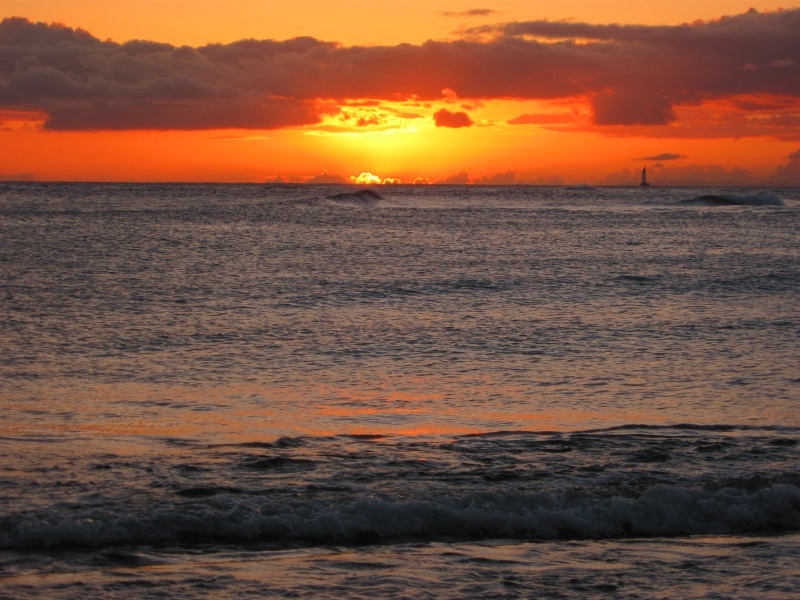 My family has seen many colorful sunsets from Poipu beach. This sunset picture below was taken by my son when he was eight years old. One final note, if visiting Kauai over New Year’s Eve, come down to Poipu beach for the spectacular fireworks. It does get crowded so come a couple of hours early to stake out your spot.